The result of many years of design and development, Teifi semitone levers are made in our workshop and are engineered to provide a very smooth and quiet up (on) and down (off) lever action, producing an unimpaired tone when the lever is engaged. Based on the concert harp principle of double forks, the strings are not moved out of alignment when the levers are on, and produce very minimal string wear, even with frequent use. Perhaps most exciting for more advanced players, the new levers are excellent for semitone slides and quick changes in jazz and more demanding chromatic music. 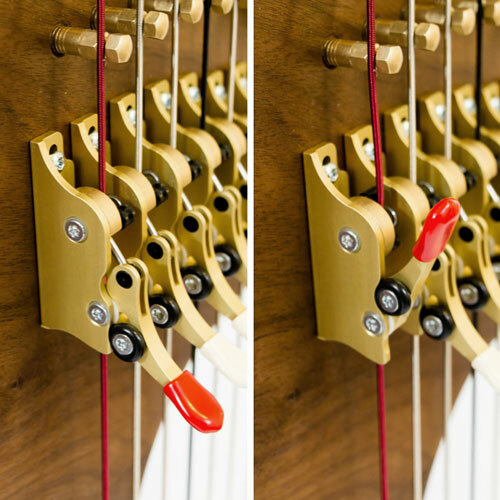 These new semitone levers are super light-weight (the largest bass lever weighs only 20g which is believed to be the lightest non-plastic semitone lever available anywhere). They are very robust and have been rigorously tested to 24,000 lever movements. All the screws on the levers are Torx screws which lend themselves to easy adjustment and are non-slip. The levers are also carefully designed so that the tension/feel of the lever movement can be adjusted if a player prefers more/less stiff levers or to accommodate different string gauges. We feel confident that the new Teifi semitone lever will give many decades of reliable, maintenance-free service and if a lever is ever damaged, it can be easily replaced (by a player themselves if required). Quiet action – no more noisy clicking each time you change a lever. Suitable for Jazz note bending. High precision machining gives you the exact semitone change in note each and every time. Easy to regulate for pitch. A gentle double action creates good string alignment, reducing wear and tear on the strings. As this video shows, our unique design is based on that of a concert harp which ‘nips up’ the string without changing the alignment. 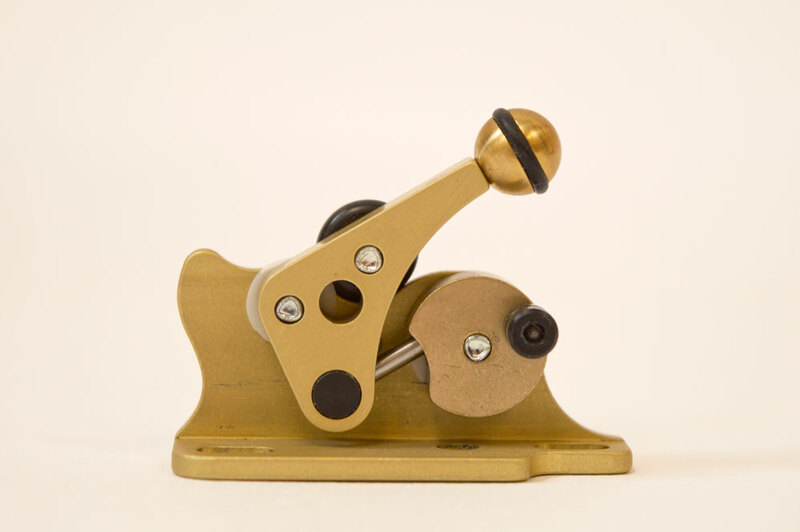 This mechanism also reduces string wear and gives a clear, unimpaired tone when the lever is engaged. Meet ‘Clanky’ the test machine. As part of our constant quest for quality and durability, we test our semitone levers on a machine which rigorously replicates the semitone lever being switched on and off 24,000 times to simulate approximately 20 years of intensive use. The lever you see in the video still works! 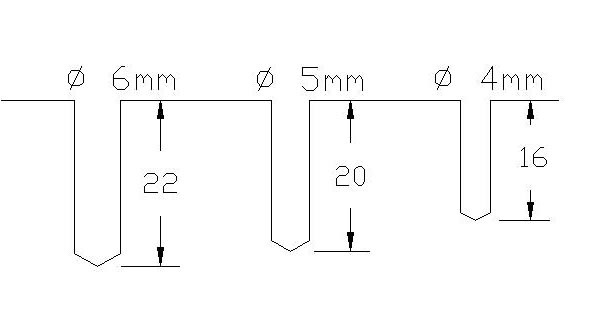 We use this information to calculate which harp lever configurations are needed to correctly fit your harp specification. The levers all come with No.10 Torx screws for attaching to the neck. The diagram for drilling holes for the lever is on the right. Remember when fitting the harp lever to leave more adjustment in the slot up towards the bridge pin as the speaking length of the string shortens with time towards sharp as the soundboard rises. Ball end semitone levers with coloured bands (Black for F and red for C) are also available. Please see pricing table for costings. We can also supply corresponding bridge pins and tuning pins if needed. 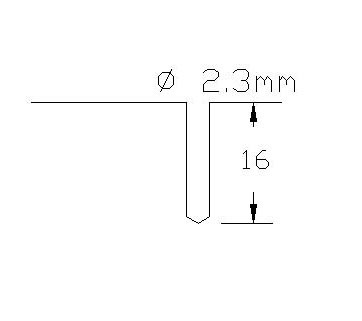 The drilling diagram for our brass bridge pins is shown to the right.